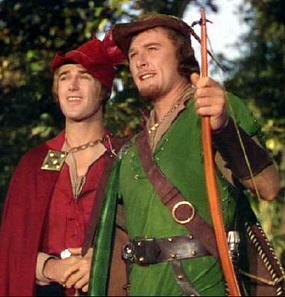 Robin Hood (Erroll Flynn) and Will Scarlet (Patric Knowles) would have been hard pressed to hide from the Sheriff of Nottingham in these clothes in The Adventures of Robin Hood (1938). 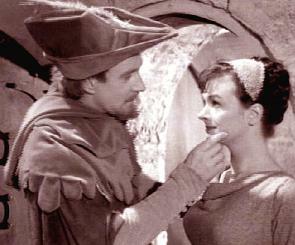 Ronald Howard would continue the concept of Will Scarlet as being a combination of fashion conscious dandy and minstrel in the 1950s Robin Hood television series. But his Will Scarlet certainly has more of an eye for the ladies than for Robin. 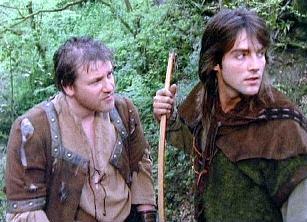 Ray Winstone restored the credibility of the outlaw Will Scarlet as Robin Hood's loyal, though somewhat argumentative follower in Robin of Sherwood.